Right, this is my first blog post so go easy. I talk about the most inspiring three hours of my short design career so far – so here goes.. I arrived at work last Friday feeling rather different. The last time I walked into our studio feeling this nervous I was clutching onto my portfolio and CV, prepared to beg Benedetto for a job. But why was I so nervous? Was there a 9am meeting I wasn’t prepared for? An impending deadline at my desk? Had trainer Jamie from Puregym made me want to vomit before work? No, not this time. In fact, today we’re ignoring our deadlines, meetings as well as Jamie and opening our door to four young students into our office for a ‘Talent Taster’. This ‘Talent Taster’ was organised by MCR Pathways, a Glasgow based organisation that ensures young kids from disadvantaged backgrounds, remain inspired and confident about their future. These talent tasters are organised for secondary school students to learn more about the jobs they think they might want when they’re older. Which means a big part of what they do is help young people discover what skills and capabilities they have up their sleeves. So back to that cold morning..
After a quick breakfast with the guys (becoming a Loft tradition), we had a team talk on how the morning would pan-out. 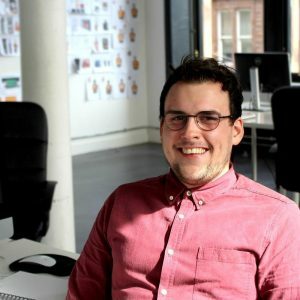 I was still apprehensive about the idea, but I guess what excited me most about this opportunity, was the prospect of a young person leaving our little studio in Merchant City, on the right path, ready to take on the big design world. Before I knew it, the team talk was over and the kids were arriving. One by one they hesitantly walked through the studio door. What I was looking at was four future Creative Directors, all be it slightly shorter than Benedetto (Only slightly), clutching onto their bags, lunch boxes and jackets. After a brief introduction we dived from the highest springboard into the deep-end, head first. Each member of the team was paired with a student. I was picked last, something I remember all to well from the gym hall at high school. My partner in crime’s name was Callum, a curious chap. Before I could show him some of my work for the loft he asks for a business card, obviously after some credentials – this young man means business. Callum instantly comes out of his shell as soon as we start chatting and interacting. I guess this is what MCR Pathways is all about: Giving young people that confidence, especially when they get one to one attention from someone who cares. We slowly make our way around the room as I show him some of our most recent projects. Callum seems not only enthralled but inquisitive. He kept me on my toes by asking loads of questions on concepts and design choices, which to be honest, I wasn’t expecting. This no longer seems like a Talent Taster experience but more like a discussion from designer to designer. It was lovely to have someone who not only wanted to hear what I do day-to-day, but to actually question it and offer opinions and ideas. I turn to Callum and question his age, my jaw almost hits the floor when he replies with: ‘Fourteen’. We grab a chair (I definitely needed one) and start the exercise I prepared on the bus into work. Our idea was to replicate the creative process, with one of the hardest briefs a designer ever has to face: Personal Branding. It starts with a mind map where the creatives had to fill in the blanks. What’s your name? Hobbies? Your favourite colour? What’s special about you? What memorable logos can you think of? Immediately after filling in the gaps Callum lifts his pencil case out and begins to sketch ideas, explaining his ideas as he does so. It feels like he understands the creative process back to front. I try to fuel his mind with some ideas to build on, but I see he’s in his own world so I let him be and grab a pen and paper myself. I glance over every so often, and see an intense look of concentration, matched with a smile. What I remember most about this experience is being astounded by Callum’s sketching abilities, and how fast he was bringing his ideas to life. With a dozen possible routes we head over to my Mac – we fire up Illustrator and after a very brief demonstration, get to work. This part of the process is where I’m needed most. Callum explains to me that his school doesn’t have a Adobe software such as Illustrator or Photoshop and he doesn’t have access to a computer at home. With such a creative mind and with so much potential, I offer some advice on where he may be able to match his creativity with useful skills that could develop his ideas and take them to the next level. You can see a light in his eyes as he watches me closely whip up some of his designs. There was an air of excitement in the room. Callum commented on how he loved how his design was coming to life and I explained to him that’s what I loved most about this job: that ‘buzz’. How our ideas start from a quick sketch and develop into finished brands, campaigns etc. Before we know it, the experience is over and we’re saying our goodbyes. Callum and the other young creatives have something valuable to take back with them – a brand – but more importantly, a realistic view of what it really means to be a designer. Reflecting back, I really got the feeling that some perspectives on life may have changed for the better that morning. Not just for the young creatives, but for ourselves as designers. It certainly made me stop and think. Think about the opportunities I’ve been given over the years, but think more about how incredibly lucky I am to be doing something I love each day – and earning a living from it. I would urge any professional to get involved in MCR Pathways. I challenge you to find any other experience so moving and uplifting that will make you or your team feel this inspired. Good luck, you’ll need it.